Even though trains are considered more eco-friendly than a pile of people driving their own cars, let’s face it – they aren’t exactly the freshest green places to hang out. So Vittori Lab and a handful of other designers got together and designed the AirTrain, which uses NASA-patented technology to improve air quality using certain plants that absorb carbon dioxide emissions and release oxygen. Check out a video of the green train after the jump. Plants are natural carbon sponges, but the AirTrain’s greenery works more efficiently than ordinary plants. 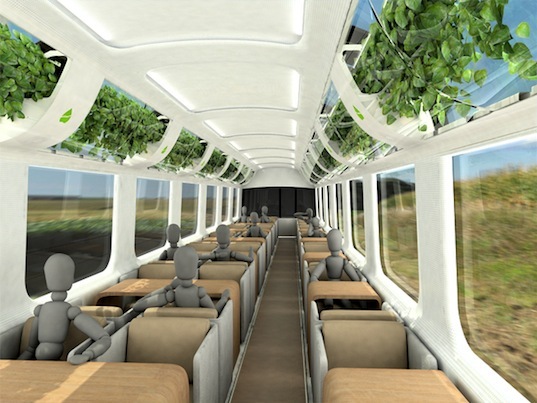 Fed in part by sunlight coming through the train’s transparent shell and watered by a clever rainwater harvesting system that “knows” when the plants need hydrating, these super plants also enhance the visual appeal of the train environment – both inside and out. The result of a working group collaboration, the AirTrain demonstrates that public transportation can feel as cozy as a lush backyard at the same time that it cuts down a population’s carbon footprint. I see this proposed design as a novelty rather than a practical solution to air filtering on a train. Imagine the costs and manpower hours involved with having to constantly maintained both the plans and the soil associated with this "greenery chicanery"? It just isn't practical. why they are designing new trains,they can use existing resource and make changes in it.Resources are limited,try to use them in effective way to yield result. Even though trains are considered more eco-friendly than a pile of people driving their own cars, let's face it - they aren't exactly the freshest green places to hang out. So Vittori Lab and a handful of other designers got together and designed the AirTrain, which uses NASA-patented technology to improve air quality using certain plants that absorb carbon dioxide emissions and release oxygen. Check out a video of the green train after the jump.